Get Recruited Event Announced This Thursday! We will be hosting a recruiting event that is presented by NCSA Representative Cecil Martin. Cecil will be breaking down the recruiting process and offering tips to help your athlete gain the edge in the recruiting process. It will be held this Thursday Night 6pm located at Christian Life High School, 5950 Spring Creek Rd, Rockford, IL 61114, enter through the Athletic Building with the Copper Roof. This is open to the public, athletes in all sports are invited and this is a free event. I am planning on having parents be available to talk with directly about their experience during the recruiting process. 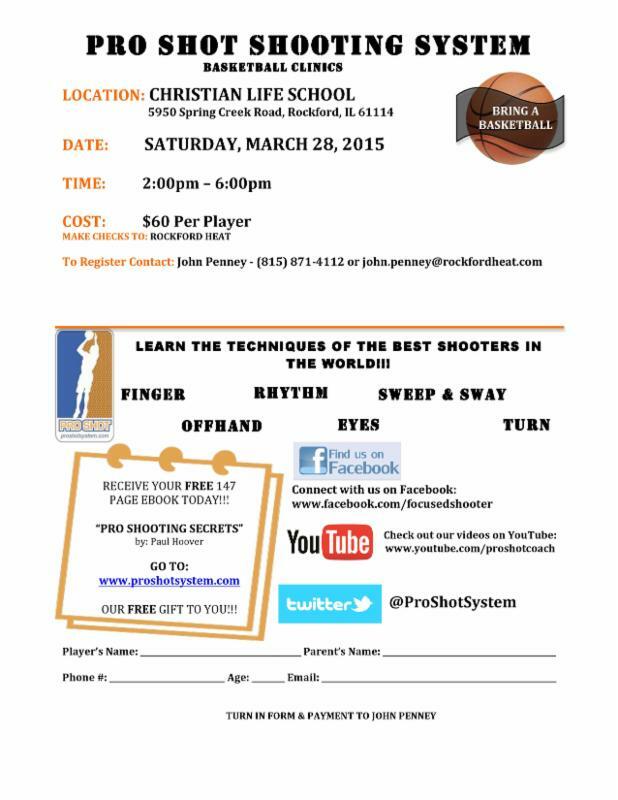 Pro Shot wishes to invite you to our Rockford, IL shooting clinic on Saturday, March 28, 2015. Pro Shot would like to announce we will be conducting a shooting clinic Saturday, March 28, 2015 at the Christian Life School in Rockford, IL. Please see the flyer posted below for complete details. Contact John Penney with any questions and to Register for the Camp. Limited space is available so REGISTER NOW! LIMITED SPACE IS AVAILABLE! REGISTER ASAP! Please make sure images are viewable in your email to see the flyer directly below. WE HOPE TO SEE YOU THERE!!! The PRO SHOT SHOOTING SYSTEM is an Advanced Shooting Program Based on Biomechanics and Focusing. The System is Currently Being Used by Thousands of NBA, WNBA, Collegiate and High School Players and Hundreds of AAU, High School and NCAA Teams throughout the United States. The PS System is the Most Complete Shooting Program. It Works because it is Simple to Comprehend and it Makes Sense. We Focus on Six Areas of the Body to Produce Accurate, Rhythmic and Quick Shooters (known as the FOREST). There is NOT a Shooting System in the World that will Improve a Player’s Mental and Physical Shooting Skills as Quickly as the PS System. BECOME AN ACCURATE SHOOTER IN MINUTES!! Pro Shot is America’s Leader in Shooting and Skills Training with Having Conducted 600+ Camps in 47 States in 2013. "The Shooting Road Show" Offers the Finest Shooting Camps, Clinics and Training Throughout the Nation. WE GUARANTEE THIS!!! A Shooting System that Actually Works!!! We DO NOT Focus on Random Drills and Shooting Games. This is a Camp Based on the Highest-Level of Instruction. This is a Camp for Dedicated Players. Creative and Well-Organized Instruction with Power Point and Video Presentations. A Shooting System that will TEACH Each Player to Understand How He or She is Missing and then Proceed to Fix the Problem. A $$$ Back Guarantee. If this is not the best shooting camp in North America and the player does not learn, we will give money back. Pro Shooting Secrets is my 150 page book that is now a free eBook. This is the 2014 edition full of new stories and techniques. I guarantee you will look at shooting differently after reading Pro Shooting Secrets. "Where Basketball Secrets are Revealed!" Shamara Glover Commits to St. Louis Community College! Shout out to Shamara Glover(Guilford High) for committing to St. Louis Community College! Shamara has accepted a full athletic and academic scholarship to continue to play basketball while pursuing her education. Shamara has worked hard in the off season to continue to sharpen her game and has shown that she is a shooter and has the numbers to show it. Shamara finished her career at Guilford by joining the 1000 point club and averaged 21.6 points per game! Great Job Shamara, all Rockford Heat Coaches, players, parents, and fans are proud of you! Rockford Heat BOYS 5th Grade Roster Posted! If, for any reason you are unable to accept your spot on a roster, please contact Gerry Ford ASAP! Mandatory Parent Meeting will be held on Sunday March 22nd at 5:30pm located at Northwest Community Center, 1325 N. Johnston Ave, Rockford IL 61101. you will need to turn in the Rockford Heat Athlete Forms(Found on Website under the Club Forms tab). That night, players will meet with their coach(s) and we will go through Club rules and expectations. During the parent/player/coach meeting, players will be fitted and you will be able to order Rockford Heat apparel. Additionally, the 1st installment of club fees will be due. 1st Payment due-$175 March 20th, 2nd payment of $125 due April 20th. 1st Payment due-$150 March 22nd, 2nd payment of $125 due April 22nd. 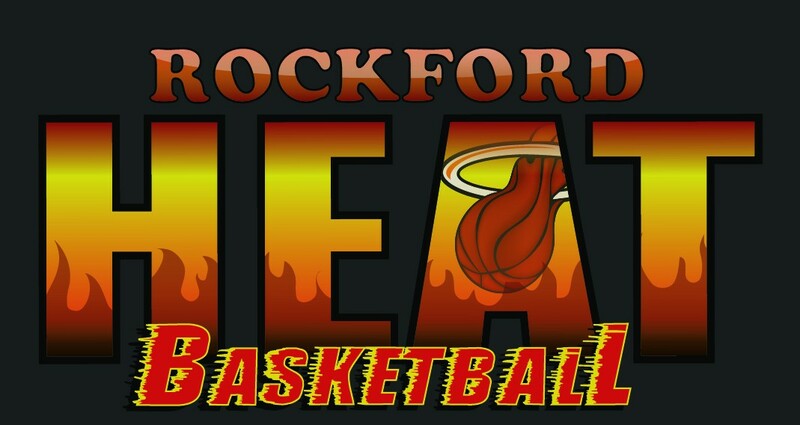 Rockford Heat 3rd Grade BOYS Rosters Posted! Pro Shot Shooting Clinic Announced! Rockford Heat is pleased to announce that Paul Hoover will be bringing his “Pro Shot” Shooting clinic to Rockford on March 28th. Please see the flier attached. Space is limited and will fill up fast! Do not delay if you want to be part of this clinic. Be sure to check out his you tube videos and links.